Congratulations to "Y-write", the winner in Marie's giveaway. Thank you to all who participated! I have always loved reading romantic suspense novels. They are a fascinating genre, having to combine action and romance, mystery and passion. They have to keep the reader guessing until the end, not only about the resolution of the romantic conflict between the hero and heroine, but also about the resolution of the mystery. 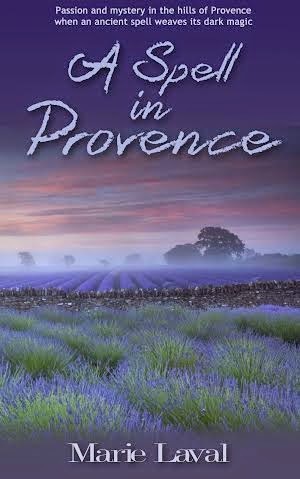 I usually write historical romances but during a family holiday in the South of France I started thinking of a plot for A SPELL IN PROVENCE. I knew I wanted to write a contemporary romance between an English heroine and a French hero, but I soon realised that I wanted to include danger and mystery too, drawn from the captivating ancient history of Provence. The more I read and researched the area of Lubéron, where the story is set, the more I learned about the Salyens - the Celtic tribes who lived there before the Roman invaded the region - the darker the mystery became ... Juggling the love story and the suspense element was an exciting novelty to me - a little like trying a new recipe! A naive, but determined, English heroine who buys Bellefontaine, an old provençal farmhouse to pursue the life-long dream of running a guesthouse. A handsome, enigmatic French hero, the owner of Manoir Coste, a vast estate and luxury hotel nearby, who keeps telling our heroine she is an amateur and is bound to fail. An ancient spell binding the lives and the hearts of the ladies of Bellefontaine and the dukes of Coste. Mix well then add a large spoonful of Provence's ancient history, including tales of a long lost temple and cryptic inscriptions in Latin on village fountains. Add a sprinkle of hostility by locals and a drizzle of passion. Whisk the mixture until the heroine has fallen head-over-heels in love with the hero. Then add a few drops of doubt and a soupçon of fear, caused by reports of gruesome murders and eerie sightings of lights in the forest. Simmer on slow heat until tension sizzles and bubbles. Pour the mixture into a love-shaped tin and bake under the watchful eye of Bona Dea, an ancient Salyen goddess from Provence. When ready, enjoy with a cup of strong, black coffee or a glass of rosé wine! Originally from Lyon in France, Marie studied History and Law at university there before moving to Lancashire in England where she worked in a variety of jobs, from PA in a busy university department to teacher of French in schools and colleges. Writing, however, was always her passion, and she spends what little free time she has dreaming and making up stories. Her historical romances ANGEL HEART and THE LION'S EMBRACE are published by MuseItUp Publishing. A SPELL IN PROVENCE is her first contemporary romance. It is published by Áccent Press. He looked down. The light of the rising sun played on his face and made his green eyes seem deep and warm. Time slowed down. The noise from the crowd became muffled and distant, and all she could hear was the crystalline spring water trickling in the old fountain. The spring that ran through the forest between Manoir Coste and Bellefontaine and bound hearts and lives together, or so the spell said … Her heartbeat slowed, or maybe it stopped altogether. It was as if Fabien and she were alone. Desire, fear and another feeling she didn’t recognise overwhelmed her and made her dizzy. Shivering in the cold breeze despite her shawl, Amy joined the guests lining up to be greeted by Fabien, who in true lord of the manor style, stood tall and imposing at the top of the steps, with torches burning on either side of him. He might wear a black dining suit and a crisp white shirt instead of a suit of armour, but there was something untamed, fundamentally uncivilized and proprietary about the way he surveyed the crowd – as if he truly owned everything and everyone, like Frédéric had said, and Amy was seized by an irresistible, irrational and overwhelming urge to flee. She didn’t want to speak to Fabien Coste, didn’t want to put up with his arrogant ways. He could keep his fancy chateau, his contacts and glamorous guests, she didn’t need him. She would walk home. It wasn’t that far. She was about to step aside when he looked down and their gaze met. Shadows danced on his face. The torches hissed in the breeze, their flames shooting high in the air and reflecting in his green eyes, giving them a deep, dangerous glow. For the space of a heartbeat, the noise of conversations around her became distant and fuzzy, and all she could see was him. He walked down, took her hand and lifted it to his lips. Even though his mouth barely touched her skin, a flash of heat reverberated through her body. It was the first time he’d spoken her first name. He made it sound French, sensual and incredibly romantic. Aimée. Beloved. Panic made her heart flutter and turned her brain to mush. He arched a dark eyebrow, looked down, and smiled as if he knew exactly what she was feeling. Marie will be giving away a digital copy of A Spell In Provence to one person leaving a comment or email entry. Sounds absolutely fascinating - can't wait to read it. It's already on my TBR list. I could almost smell the lavender! Great recipe! This sounds like a wonderful romantic suspense. Adding this one to my TBR. Loving the ingredients & such a beautiful cover. Congrats to Marie on the new release! Sounds like a winning recipe :) thanks for sharing! I want to read t his book!